What Do You Really Want, Dwight? 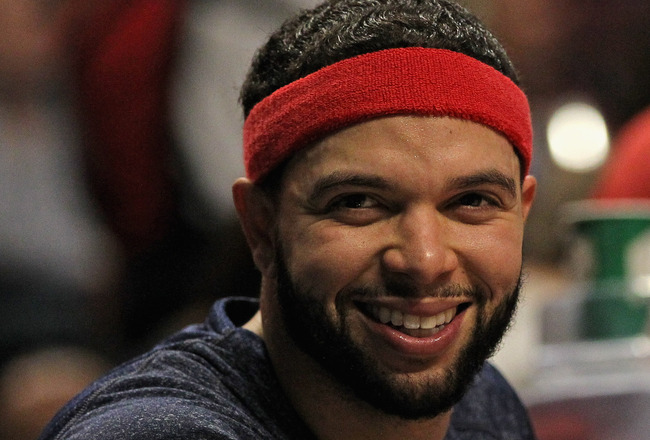 This NBA player might honestly be the most perplexing player in the entire association. Dwight Howard – the man that just opted in for one more year with the Orlando Magic this past season – met with new and confused Magic GM Rob Hennigan on Friday. Why? He told him (as if he is the general manager himself and has the authority) that he wants to be traded to the Brooklyn Nets, according to sources close to this bizarre situation. Hennigan did not tell Howard what his plans were with the All-Star center. This story isn’t over. Those close to Howard have reported he feels as though his team blackmailed him into signing the “opt-in” clause by threatening to trade him to the Los Angeles Lakers and that he might even go as far as to file a case with the NBA Players Association (NBPA) which would allow him to be an unrestricted free agent this summer rather than the next. However, this would be a case far from Howard’s reach; he would have a better chance of creating a time machine back to March 15 – when he opted in – than winning this possible case. What is set in stone, though, is two separate meetings that will take place Monday. 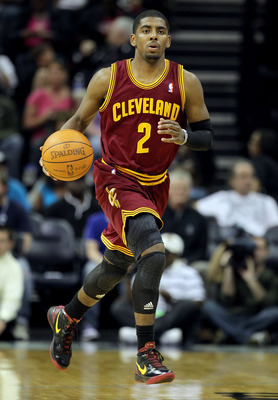 Williams will meet with the Nets and Mavs, giving them each an opportunity to present a succulent offer. With free agency being just around the corner, much more will become apparent soon enough. And before we even get a chance to take in that one big-time, self-important superstar got his ring, another one might soon be on the move. After both teams started their 2011-2012 season blazing hot only to cool off down the stretch, the Minnesota Timberwolves have agreed to send their 18th pick in this year’s draft to the Houston Rockets for 3-point specialist Chase Budinger and the draft rights to Isralian professional basketball player Lior Eliyahu, according to two league sources. 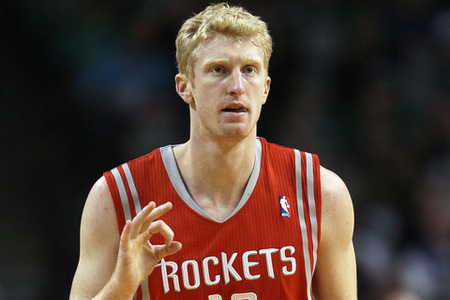 Budinger finished his second year with the Rockets averaging 9.6 points and 3.7 rebounds while shooting 40.2 percent from 3-point range. These numbers don’t provide a just representation of his potential or lack there of; the former Arizona Wildcat had moments throughout the season when he looked to be on the verge of breaking out of his NBA shell and others when he needed to sit right back down on the bench. His last two games provide an appropriate representation. After putting up five points in the second to last game of the year, he followed that up with 27 points to finish the season. Changing scenarios could push him in either direction, but one thing is certain: Kevin Love will no longer be the Timberwolves’ leader in 3-point attempts. It is clear what the Rockets want: Dwight Howard. Currently in possession of the No. 14, No. 16 and No. 18 picks in the draft and also pushing to trade Kyle Lowry and everyone else on the team (literally everyone) for even more draft picks, they are attempting to put together an offer that the Magic just can’t pass up. General Manager Daryl Morey has quickly become aggressive and determined to bring the big man to the franchise. However, the big man would be a part of the franchise as long as Tyson Chandler lasted with the Dallas Mavericks, according to David Aldridge of NBA.com. “A source with knowledge of Howard’s thinking said Monday that there was ‘not a chance’ Howard would be persuaded to remain in Houston if traded there, and would leave next summer to sign elsewhere,” Aldridge reported. 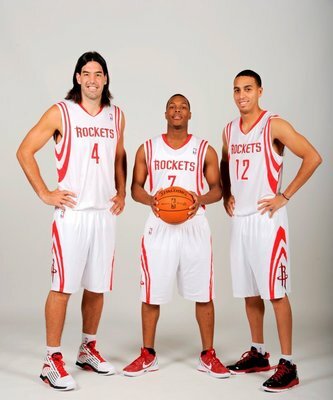 Will any of these players be back in a Rockets uniform next season? The Rockets shouldn’t be surprised since Howard wants to go where he will receive a great deal of attention and where his name will be plastered all over the news media. Houston is not the place to go for that. But Houston doesn’t care. Why? 9th place and 14th pick. 9th place and 14th pick. 9th place and 14th pick. The Rockets have driven themselves into basketball irrelevancy, finishing each of the past three seasons literally in the middle of the pack in the exact same spot with the exact same draft pick. As management, this is the point where you must make the conscious decision to “shake things up” no matter the cost or risk. Bringing in Howard has it’s cost. It has it’s risk. But it puts them right back on the NBA map as they will undoubtedly become somewhat important, increase revenue by simply winning and make the playoffs – finally. 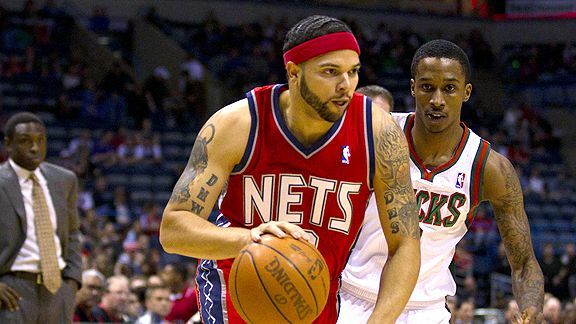 The biggest consequence this could have on the league is it could change Deron Williams’s statement that he will only be going to either the Dallas Mavericks or staying with the Brooklyn Nets. As he has made clear in one way or another the past few years, the enticing idea of playing with Howard is high on his bucket list. Why shouldn’t it be? These two All-Stars have become good friends through Olympic play and would both love to play with each other. With barely any roster spots currently guaranteed and with enough cap space to sign two max-contract players, the Rockets could do the unthinkable and bring in two game-changing players that play the two most important positions on the floor – if Williams doesn’t mind rooting for the Texas Rangers a few hours outside of Arlington. Whenever a blockbuster trade is on the verge of taking place, people can’t help but analyze the situation from the perspective of the team that will be getting the main blockbuster piece. Orlando shouldn’t be forgotten since they couldn’t be asking for a better situation. Obviously, the Rockets are planning something big. They want Howard badly and will gift-wrap just about every single piece that relates to the “future” in their organization. By the time Thursday’s draft arrives, they will most likely have attained a top 10 pick that they have been eyeing – in order to hook Howard, of course. In a draft so deep that Draymond Green and Royce White are projected to go in the 20s, this is the perfect year to stockpile as many picks as possible. They can get just that by working with Houston. D12 does not know what he wants. In fact, he doesn’t know how to handle not knowing what he wants. As he has shown countless times throughout last season with his wavering attitude literally from day to day and his reliance on others telling him what to do, he is a detriment to a team’s atmosphere. If he wasn’t the best center in the league and didn’t have an larger impact than every other player in the league not named LeBron James or Rajon Rondo, he would already be out of Florida. Orlando should rid themselves of this interminable problem as soon as possible. The biggest problem in getting this deal done is Rob Hennigan. Since he has been the Magic general manager for less than a week, he wants to do what he wants do. (Clear enough?) He hasn’t even been given the chance to be stressed out with his Howard problem and figure out what type of offers are out there. Unless the Magic enjoy killing their locker room atmosphere, hope that their current All-Star will walk this next offseason or don’t want start anew with some fresh, young talent, they should send Dwight Howard to the Houston Rockets. Van Gundy can finally move on with his coaching career and Smith can stop making bad moves for Dwight Howard’s Magic. After a few weeks have passed since being knocked out of the first round by the Indiana Pacers, The Orlando Magic have decided to let Head Coach Stan Van Gundy go after five years in which he went 259-135. His team won three division titles during this time period. General Manager Otis Smith and the Magic organization will also be parting ways after this frenzied season. Oddly enough, Van Gundy made it clear he wanted to return as the head coach of Orlando next season. “Yeah, I want to come back, but that’s not up to me,” he said during one of the most awkward encounters caught on film. He desired to lead the Orlando Magic – even if a certain superstar center seemed to want him out. Well, that superstar got his wish. Howard, yet again, succeeded in playing a role not fit for all players but only for the elites of the elite. Even though Van Gundy has found a way to constantly work with the odd pieces Smith has thrown at him and consequently bring about successful season after successful season, a player with one year left on his contract removed him from his duties. This is why Van Gundy should be considered one of the hottest free agents of this offseason. He has a great understanding for the game and is currently the best option a team can find in a coach. If he finds the right organization and the right system to fit his coaching style, he can do some real work for a ballclub. So, what does this mean for that guy by the name of Dwight Howard? There is the notion out there that these firings (or partings if you want to be politically correct) gave D12 just want he wanted to sign an extension in Orlando. This is fool’s gold. Yes, this happy, optimistic point of view is probably and could end up taking place as early as this summer. However, that possibility actually justifies why the next move by Howard can not be foreseen. When it comes to a player that has been more wishy-washy than a presidential candidate, that has shown an inability to agree with what his agent is feeding to the media and that has no sense of what loyalty to a franchise truly means, no one can legitimately predict what Dwight Howard will do in the near future. Howard once said that the Magic and their fans will have to “roll the dice” when it comes to him staying or leaving. Whoever steps in as the next general manager and coach of the Magic will not only have to strategize for the game of basketball but also for a convoluted game of dice. There probably won’t be much drama in this one. Even though Derrick Rose might not be at one hundred percent, the defensive mindset of this team that led the league in opponent points per game (88.2) should help them cruise into the second round. And when backup big men Omer Asik and Taj Gibson step onto the court, the defensive intensity actually rises. 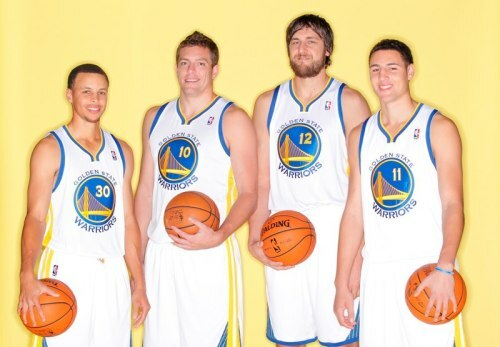 They have too much depth and too much defense for the Sixers to have a chance in this series. Evan Turner said he preferred playing the Bulls over the Miami Heat… he is about to realize both of those scenarios do not end well for his team. Last year, the Bulls were stomping through the Eastern playoffs, but ran into the Miami buzz saw in the conference finals. Will America see a repeat this year? A lot of celebrity power, but not much substance. Miami is on a mission to avenge last year’s loss in the NBA Finals, and the Knicks just don’t have enough talent to keep up. The soon-to-be three time MVP LeBron James has had one of the most astounding statistical seasons (so far). Yes, he has his constant fourth quarter LeBron haters, but this is not a series where he will choke. He loves playing in New York’s arena, so road games will be just as nice as home games for him. Moreover, New York still isn’t sure just what their identity is. Where does Jeremy Lin fit in? How do they use Amare Stoudemire? (Will they ever figure out that last question?) How much should Carmelo Anthony carry the team? Melo has been playing the best basketball in the league the past month, but he won’t be able to play another month with his point guard-less team. Last year, the Celtics swept the Knicks in the first round, and it is very possible that Miami could unleash the same embarrassment on the guys from Madison Square Garden. No Dwight Howard, no chance. Pacers move on. Even though this matchup has two teams with similar records, there couldn’t be more disparity. This aging Boston team has found some life behind the athleticism and vision of Rajon Rondo as they finished the season 23-10. Rondo’s 24 straight games with double-digit assists is amazing in an era that values point guards scoring over distributing. He provides an impact similar to Dwight Howard and LeBron James: even with his solid statistics, his influence on the team can’t be contained on a sheet of paper. Even with Ray Allen’s injury, the Celtics have a breakout player in Avery Bradley that can temporarily fill in for a hobbled Allen. As long as the Hawks keep their core of Joe Johnson and Josh Smith, I don’t see this team ever emerging out of the middle of the East. The championship experience on the C’s is going to overwhelm a Hawks team that always manages to underwhelm in the playoffs. Utah and all of the team’s blue-collar players clawed their way into the final playoff spot in the West, and they have been rewarded with a matchup against one of the hottest teams in the league. The Spurs finished the regular season on a 10-game winning streak and two of their big three are finally healthy and fitting into the system. Very similar to last year, out of nowhere, San Antonio logged the best record in the league (tied with Chicago) with Tony Parker having another great season. The Spurs need to be careful, though. They were in this exact same position last year and got stunned by the eighth seeded Grizzlies in the first round. However, it won’t happen again. The experienced Spurs won’t let it happen twice. Even though the Jazz will be exiting the playoffs early after a hard fight, making the playoffs is huge step for this up-and-coming squad that could soon emerge in the West with their overwhelming frontline of Jefferson-Millsap-Favors to challenge some of the best. This is an interesting re-match of last year’s Western Conference Finals. However, neither team really has any momentum as both teams went 7-7 to finish the season, although Dallas has been playing some very uninspired basketball recently. However, it can’t be ignored that Jason Kidd hasn’t played basketball in a week, which should be a huge boost for the 39-year-old point guard. Last season, after a well-rested break before the first round of the playoffs, he scored 42 points in the first two playoff games. There’s enough veteran leadership on this team to potentially give the Thunder a tough series. As long as Dirk Nowitzki is playing basketball, the Mavs have a chance to do something in the playoffs. The players to pay attention to in this series are Delonte West and James Harden. West has come back from his broken finger injury and been the spark for the Mavs that they lost when J.J. Barea left the team. He utilizes picks very well and knows how to get into the paint. He brings some play off the bench that will be necessary since their opponent has the soon-to-be Sixth Man of the Year. However, if Harden is not himself after a certain Laker’s elbow assaulted his face, a shaken up Harden completely changes the outlook on this series. One weakness the Mavericks might exploit is the fact that Oklahoma City sits next to last in the league in assists. 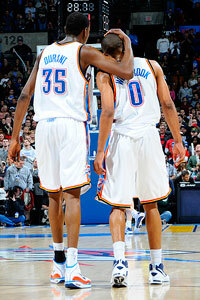 If they can get the ball out of the hands of All-Stars Kevin Durant and Russell Westbrook, Dallas could pull the upset. A lot has to go the Mavs way, though, as the league’s leading scorer might just burn the defending champs. The Lakers will be without Ron Artest Metta World Peace, but Los Angeles should still have enough firepower to handle a Nuggets team whose highest paid player is Arron Afflalo. Initially it seemed like a great story that George Karl had a group of players that didn’t have an egotistical superstar. Every player bought into the team’s system and fed off each other. However, this is the time when superstars emerge. This is the time when big shots have to be made and championship contending teams know exactly whose hands the ball should be in when the game clock is winding down. The Nuggets don’t know whose hands should have the ball. Furthermore, the Lakers have just too much size in Andrew Bynum and Pau Gasol for skinny Javale McGee and breakout rookie Kenneth Faried to handle. The Lakers will move on, but if they do so too quickly, their suspended fighter will miss some crucial games in the second round. The question you didn’t hear at the beginning of this video was if Dwight Howard truly did say he wanted Stan Van Gundy fired. Wow… I’ll let the rest of this video speak for itself as you watch the epitome of awkwardness take place at the 2:40 mark.